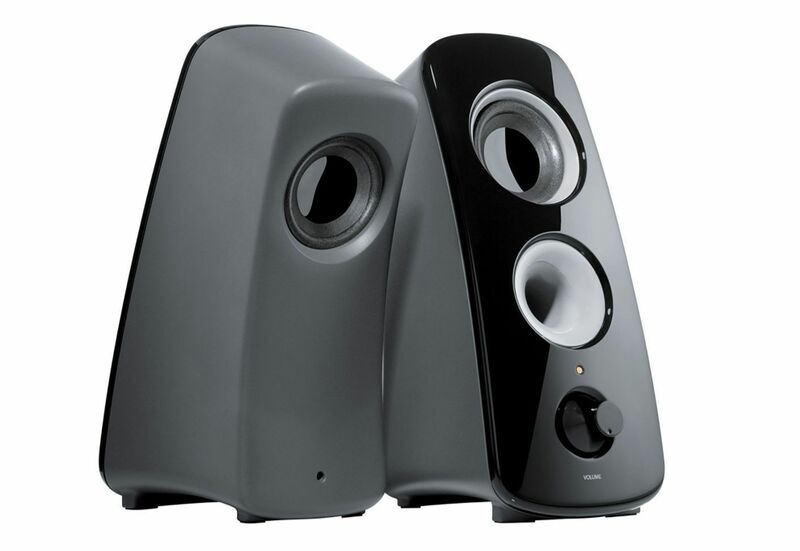 Finding an acceptable balance between low and high frequencies was an ongoing exercise with this 2.1 system. 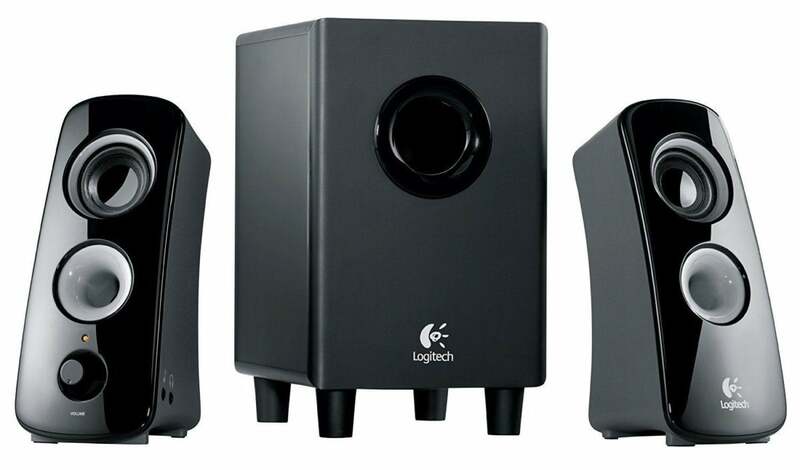 The Logitech Z323 ($70 on Amazon) is one of a handful of 2.1 computer speaker systems Logitech offers. With 60 watts of peak power, it employs a dual-driver speaker design along with a strong bass output to deliver “room-filling” sound. Each of the Logitech's Z323’s satellites measures a space-saving 8.3-by-3.4-by-4.5 inches. The glossy faces and uncovered tweeters give them a sleek look but also made us not want to handle them too much for fear of leaving smudges on them or damaging the drivers. A second tweeter is on the back of each satellite to project sound evenly in every direction, according to Logitech, allowing you to get a seamless audio experience no matter where you are in the room. The 8.9-by-5.5-by-8.5-inch bass unit has a 4-inch down-firing subwoofer and sits on four legs that give it about an inch of clearance from the desk or shelf surface. A power knob on the right satellite doubles as the system's master volume control, while a bass volume knob on the back of the subwoofer lets you add to or subtract from the bottom end. The right satellite also has a pair of 3.5mm ports on the side, one for headphones and the other for connecting an auxiliary device like your phone or mp3 player. Each satellite includes two tweeters—one on the front and one on the back—to project sound evenly in all directions. Each satellite comes with its own attached connecting wire to plug into the back of the subwoofer: the left to an RCA jack, and the right to a 9-pin serial port. 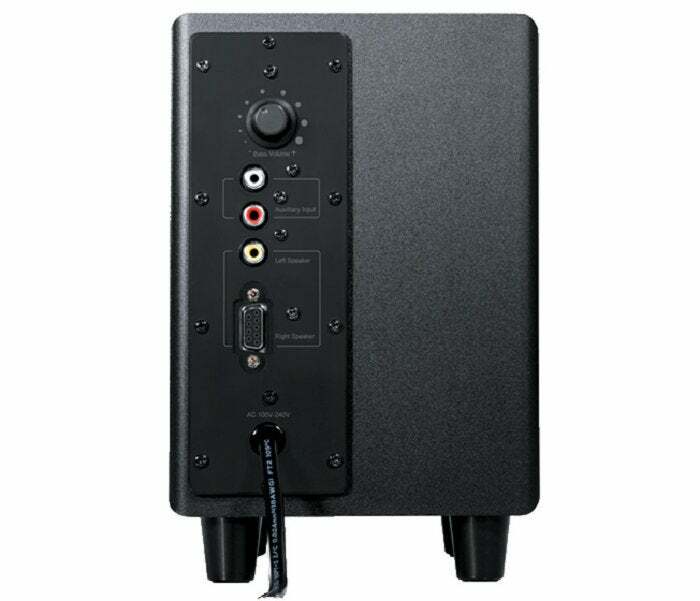 An extra pair of RCA inputs are included on the back of the sub in case you want to add your home theater/stereo system to the setup. The Z323 lives up to its “360-degree room-filling sound” promise. At just about the half-volume mark, they delivered a fairly consistent audio level from every vantage point in the room we used them in. But while they give a PC a much needed output boost, the sound quality isn’t great. The sub thickens up your PC speakers’ otherwise anemic bass, but it has an indistinct, boomy quality. This gets more apparent when you turn up the bass volume on the sub, and it overwhelms the satellite’s crisp highs and muddies the mix. Finding the right balance between low and high frequencies was an exercise we often had to repeat with each song we played. That’s a lot to ask from a casual listener who just wants to click play and get on with their business. The down-firing subwoofer had a boomy quality that tended to muddy the sound. The Logitech Z323 will definitely bring a fuller, more powerful sound to your PC and devices. That may be enough for a certain amount of users. However, the bass’ boomy quality and the near-constant effort required to balance in the mix make the system hard to recommend for more discerning listeners. Check out PCWorld's guide to the best budget computer speakers to see some of the other options available. The Logitech Z323 is a powerful speaker system but the effort required to balance the boomy bass makes it tough to recommend.